While Charlotte was fighting cancer, many of her friends asked for donations to her cause instead of birthday presents. What a great way to teach kids about giving back to those in need! In that spirit, we invite you to celebrate your child’s birthday (or any special event) in CJ’s honor. Whether you are celebrating a birthday, wedding, or any other special occasion, you can start an individual fundraising page to track donations made in honor of your special day. 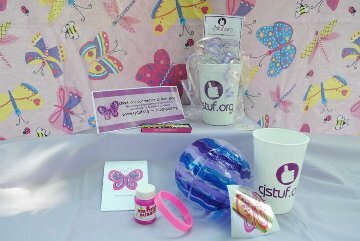 With ample notice, we can provide you with CJSTUF bookmarks or some other "swag" items for your celebration as well. Click on the "Start a Celebration" button below to get started! Using your fundraising page, you can share your efforts with friends and family and ask for support.